Hello! Yes I am still alive and still eating. My third child was born in May and while she is an absolute love and doll baby it has not made a return to blogging easy considering my business, children and other commitments! But I have been thinking about the blog and plan to write a bit more often even if I don't have photos. I know everyone loves photos but that coordination is one of the more difficult parts of blogging. If possible I will add some to this post and delete this! We just took the kids (yes all 3 of them) to Quebec City and enjoyed the pastries, "chocolat chaud" - I taught my older 2 kids to say this before we left - and cultural and outdoor activities there. We also learned that my older daughter loves escargot and enjoyed them fresh out of the shell! As far as restaurants we were not able to sample any of the really high end places since I did not reserve any child care while there, but we enjoyed La Buche, Bello and Chez Jules in the old city area and also Casa Monna et Filles restaurant and cassis farm and the Ile D'Orleans Chocolate Shop - you must get the chocolate dipped ice cream cone. As luck would have it the above 3 restaurants had no problem with us ordering takeout which was very helpful the kids! Then we would either eat at our apartment - 3rd floor walk-up courtesy of AirBnB or eat by the beautiful fountains near City Hall which my kids also loved running through. We had a terrible experience with American Airlines on the way - cancelled flight made us delayed by 30 hours, yes that is thirty not three! On the plus side they let us change our flight back so we stayed an extra night at Valcartier Hotel where the kids swam and hit the waterslides at the indoor Bora waterpark. We saw an awesome fireworks display and the Flip Fabrique free acrobatics circus which apparently comes with a new show every year. Another upside to our flight being that late and us arriving in the 10-11 PM hour was that the kids stayed up later than usual the whole time. While that might not usually be an upside, it allowed for us (and them) to experience some of the evening activities that we would not normally allow because of the timing. And we typically all took a long nap so that was also positive. Polish Platter with mashed potatoes. Chicken Samsa and Potato and Mushroom Pieroshki. Two Soups: Borsh and weekend soup Solyanka. Pelmeni (L) and Pierogi (R). My favorite things were the pierogi - where have these been all my life? The only ones I ever had before were back at Oberlin College in Ohio where I went for one year and they tasted nothing like the delicious pockets served at Babushka's Pierogi.You can get potato and cheese, sauerkraut or potato and mushroom pierogi and they come with carmelized onions or butter and chives - yum. The sour cream served in the middle accentuates the flavor even more - I am starting to drool thinking about these! I had never even heard of pelmeni, which are dumplings made with beef and pork. Another kid-pleaser for sure! Russian meatballs and pierogi with sauerkraut. We were able to try a sample of the Hungarian goulash as well - delicious beef stew with vegetables. Definitely a good choice on a cold day. For dessert the chocolate turtle cake was a hit with the kids but I preferred the subtler honey cake. Both cakes have very impressive layers. We had so much food that we took some to our Russian friend and she declared it just like home! If that's not an endorsement I'm not sure what is! I encourage you to give Babushka's Pierogi a try. You will be glad you did! They also offer catering services and sell pierogi, pelmeni and cabbage rolls frozen. There is also a small grocery section containing Russian and European products. If you go, let me know what you think! Honey Cake and Chocolate Turtle Cake. Russian and European products for sale. Disclosure: The food described was complimentary, but the opinions are my own. Hopefully you have already heard the incredible news that Golden Cow Creamery is coming to South End next month at the corner of Church and Summit. This is particularly exciting for me since the store will be within walking distance from my office and a light rail ride (or longer walk) from my house. Founders Alex and Liz Hannah are opening Golden Cow in order to bring unique and delicious fresh hand crafted ice cream made with premium ingredients to Charlotte. When I heard this news it brought to mind my obsession with ice cream - as loyal readers may remember I once won an ice cream contest back in Atlanta with my lemon-basil chocolate chunk flavor - and it reminded me that for a brief time my husband and I contemplated opening our own ice cream shop here in Charlotte. We did not! 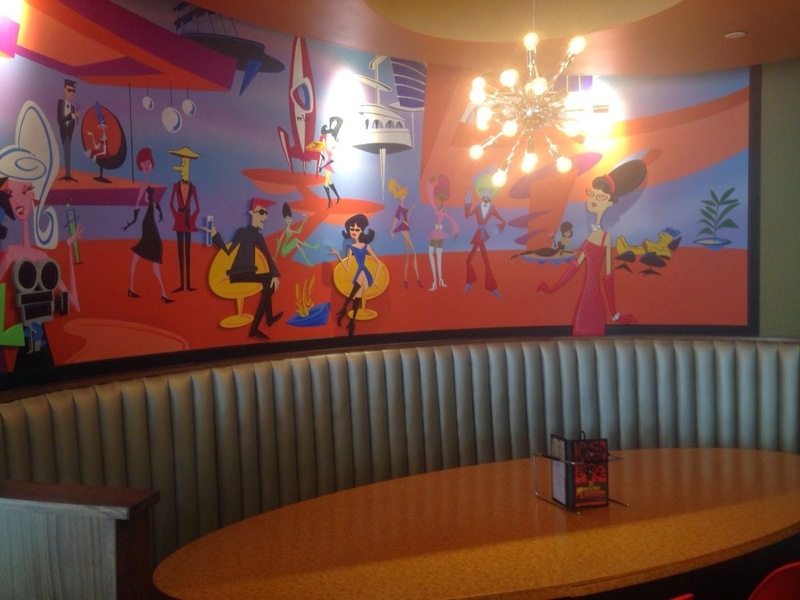 But this is still missing from Charlotte so I truly hope Golden Cow takes off! Liz and Alex Hannah, founders. I was lucky enough to be given some of their ice cream to sample. I tried Chai Spice with Candied Orange Peel and Vegan Coconut Green Tea with Lemongrass and Chocolate. The Chai Spice was awesome - I love candied orange peel so this really hit the spot. Unfortunately for me after my initial tasting my husband ate the entire rest of the sample before I had time to try some more! I think the orange peel would also taste great with a dark chocolate ice cream - yum! The vegan ice cream had a great flavor. Since I am not a vegan I probably wouldn't order it - I love the cow's milk cream too much - but it is wonderful that vegans (and the dairy intolerant) will have options here - I am sure they will come running! Golden Cow is currently doing a Kickstarter campaign, and if you are so inclined you can buy the right to a daily scoop for life or other less expensive perks including an initial scoop and membership in their pint of the month club! There is a sweet video you can watch documenting Alex and Liz's dedication to the project. Hop Drop Ice Cream featuring beer from NoDa Brewing - I can't wait to try this! I can't wait until they are open - this is such great news for the neighborhood and for Charlotte. I was lucky enough to have freshly baked cranberry orange scones delivered to my office personally by The Scone Shop's owner and founder, Fielding Williams. The scones were still warm from the oven, buttery and delicious with the perfect amount of sweetness. It was also delightful to talk with Fielding and hear her story. 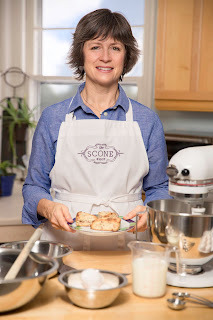 The idea for The Scone Shop came after Fielding made cookie dough to help her son with a fundraiser. She tried scone dough next and it was a hit. 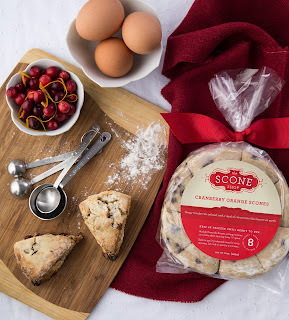 Now you can buy the frozen scone dough at several local markets in Charlotte including Healthy Home Market on Central Ave., Whole Foods, Reid's Fine Foods and you can buy a warm scone ready to eat at the Nordstrom EBar at Southpark. The scones are also available at select locations in Raleigh, Durham, Chapel Hill, Winston-Salem and Fort Mill, SC. Custom orders are also available to be delivered. 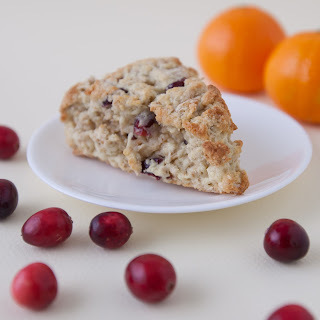 In addition to my in-office sample, I received a full package of the cranberry orange scones to bake at home. My family loved them - what a great treat without any of the hard work that goes into making homemade baked goods! I think these would make a great gift for Valentine's Day and would add a special touch to any breakfast or brunch menu! I look forward to trying some of the other flavors, which include: cinnamon chip, butterscotch chocolate chip, chocolate cinnachip and savory option spinach feta. Disclosure: The product described was provided to me, but the opinions are my own. Hiya Truck - where the Korean goodness is produced. I LOVE Korean food and Charlotte does not have enough of it. When I heard about Hiya Food Truck I knew I had to try it. I got in touch with owner Daniel Pitre and came by his truck one rainy day to try some of the options. I came so early that the food wasn't ready yet and he was kind enough to make a special delivery to my office - I was honored to get such special treatment! The bulgogi is my usual go-to and it was very tasty but I liked the spicy pork better - so delicious, great spice! Other menu items include the bulgogi burger and chicken katsu. I love that there are noodles and rice in the dishes and that they are served with daikon pickled radish (that's the yellow item!) Later the same day I decided I needed more so I also tried the dumplings (not pictured) and they were a huge hit with my 3 year old. I actually only got one because he liked them so much. 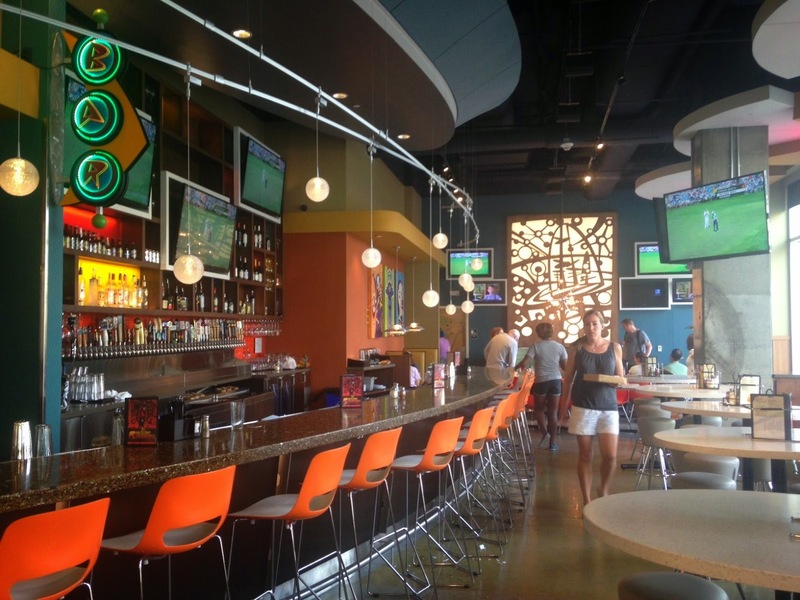 Hiya is regularly at several breweries and you can check out where they are on their website as well as via Facebook and Twitter. If you haven't tried Hiya yet, give them a shot! I'll see you soon Daniel and Hiya! Bulgogi and Spicy Pork from Hiya. Disclosure: The food provided was complimentary, but the opinions are my own. Wewalka Prepared Dough - Tasty and Easy! I was recently invited to try Wewalka European Pastry Dough. The Austrian company makes 2 types of pizza crusts (Family Style slightly thicker crust dough and Bistro Style thin crust dough), croissant dough and puff pastry dough and all the doughs are now available in the United States. All four types of dough are conveniently rolled up on parchment paper for easy use and are available at Harris Teeter locations in the Charlotte market and Ingles locations in the Atlanta area. The doughs contain no hydrogenated oils, no corn syrup and no bleached flour and they are vegetarian (no meat products). My family truly loved these doughs - especially the round pizza dough (Bistro Style - the Family Style is rectangular) and the puff pastry dough. I made all sorts of pizzas as well as rolled croissants with sausages and with chocolate (not pictured). I really like using the puff pastry for pizza as well - very elegant and tasty. The Wewalka Recipe collection helps with more ideas. Having the pizza dough on parchment paper that you leave in place while baking is SO helpful. Although other companies' big balls of dough look fun, my experience is that rolling the dough ball into what you want can be difficult, not to mention messy! 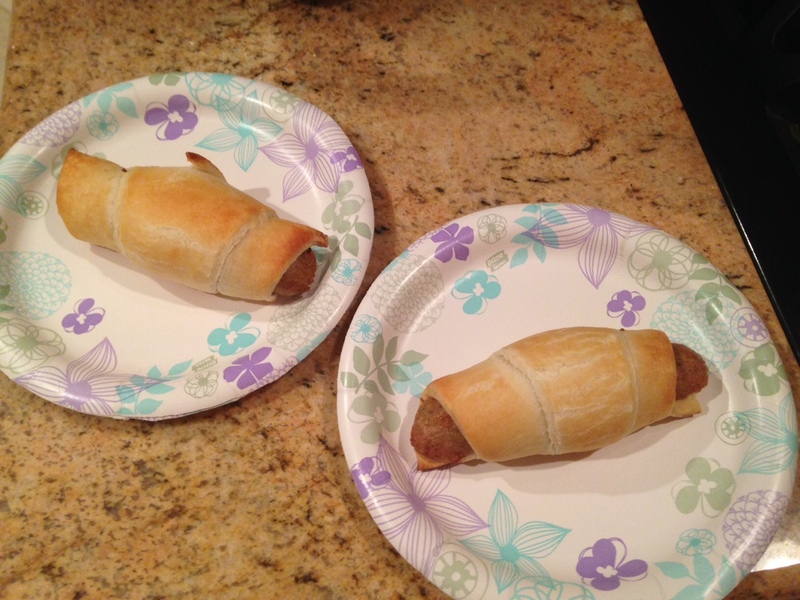 Wewalka makes it very easy with the crust already rolled and clean-up is quick and painless. Look for all four types of dough in the refrigerator case near the biscuit dough. There is also a coupon on the website here. 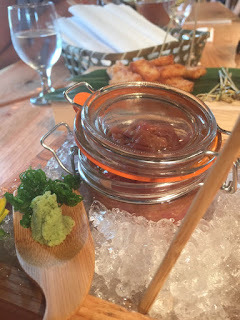 Futo Buta has quickly become one of my very favorite restaurants. Lucky for me it is within walking distance of my office so I am able to visit regularly. 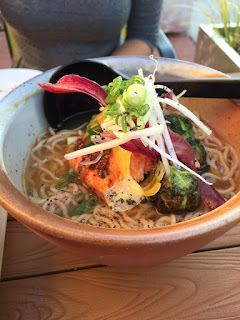 The ramen here is amazing, with several varieties including classic versions with pork belly, a salmon version, a ramen with parmesan cheese and even a vegan ramen. I can't wait to come here when it is REALLY cold to have a bowl and warm up. I also love the creative side dishes like the awesome brussels sprouts and shisito peppers and the raw items, featured on the fresh sheet daily. 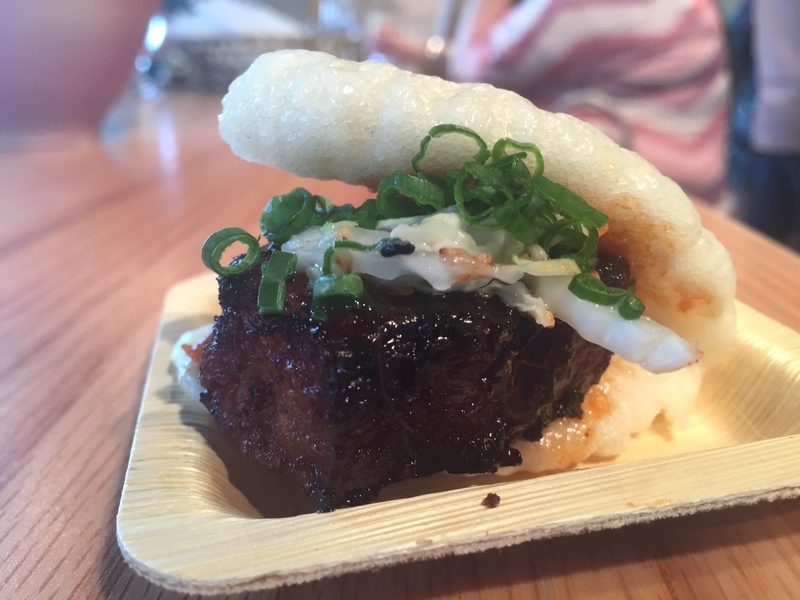 The pork belly buns are awesome too. And to top it off, they have homemade soft serve ice cream, usually green tea (my very favorite) and a second option. I am a huge fan of Japanese food in general, having spent a semester near Osaka in college; Charlotte finally has a real ramen house and I am so glad to be able to visit frequently! 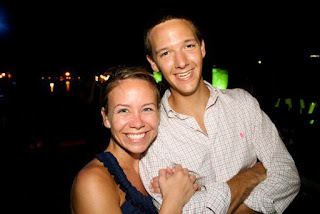 Thank you to my cousin Jason and his fiancee Yvonne for some of the photos! Salmon Belly - so smooth and delicious. Rice crispy squares with spicy tuna on top. 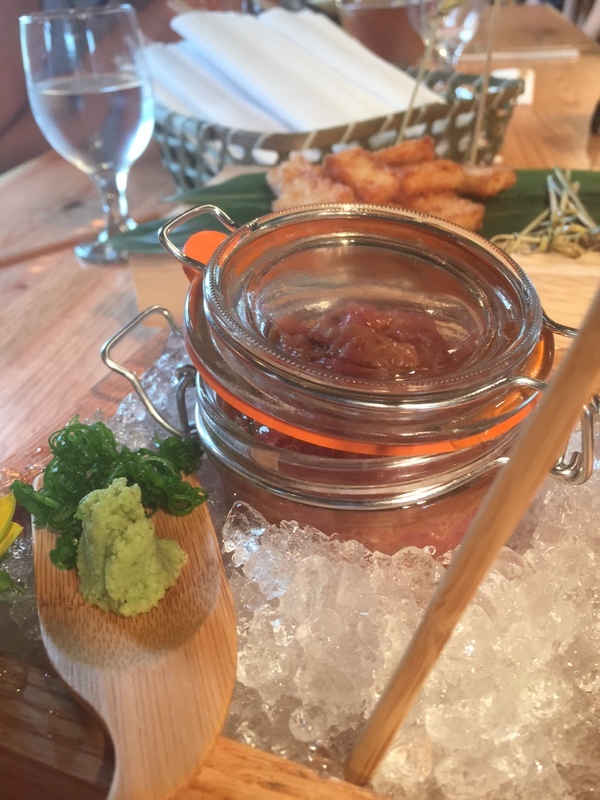 This was from the media opening but now it is served with a soy/wasabi sauce that is even better than wasabi alone! 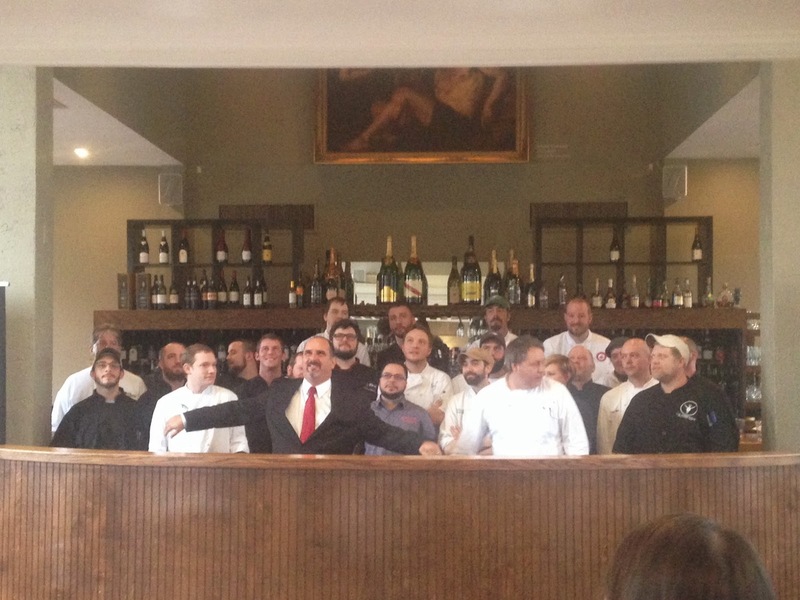 The chefs just after being announced! 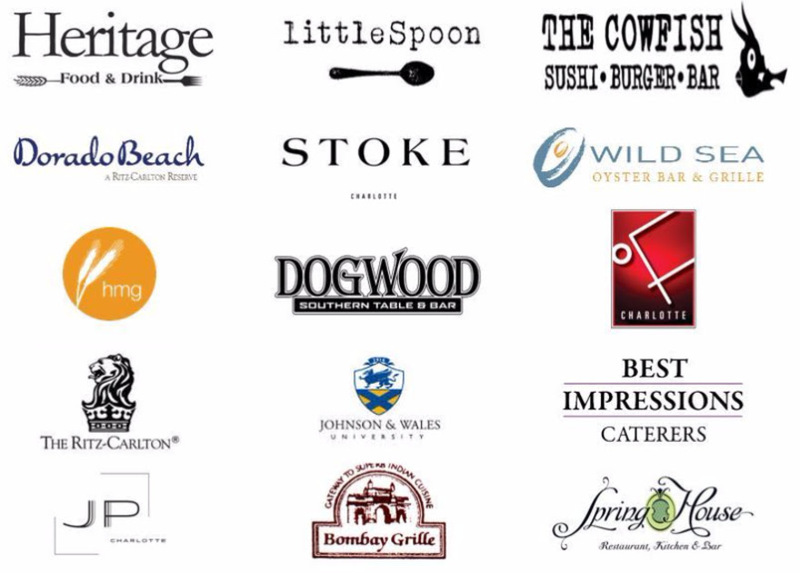 The NC Competition Dining Series will once again be held at Bonterra Restaurant beginning March 23. 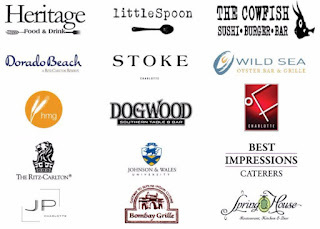 Twenty-Four chefs from the mountains to Charlotte will compete iron-chef style with attendees voting on each dish via a free app without knowing which chef prepared which dish. The winners will face of in semi-finals and finals, with the series concluding in early May. Local NC products are heavily featured, with a particular product/food highlighted during each battle. 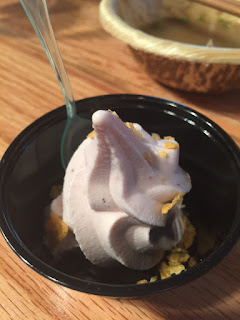 Last year I attended one of the battles and it was a lot of fun - ingredient was sweet potato! This year Amy on Food will be one of the media judges in the battle between Paul Verica of Heritage Food & Drink, versus Vincent Giancarlo of Cantina 1511 on March 23. Looking forward to being in on the action but that is the beauty of this event - all diners get a say in who wins, not just the media judges! I have been extremely busy over the last few months with work and family. In June 2015 I had my daughter who is now 8 months old. Between the two kids (I also have a 28 month old son) and my thriving law practice (adoption and surrogacy) I stay very busy! But finally - now that the baby is sleeping through the night - I am committed to getting back to blogging - yay! I have still been dining out a good bit even though I have not had time to post often. Last year I was invited to sample the menu at Baku, likely the trendiest restaurant in Charlotte and a place I have enjoyed several times. 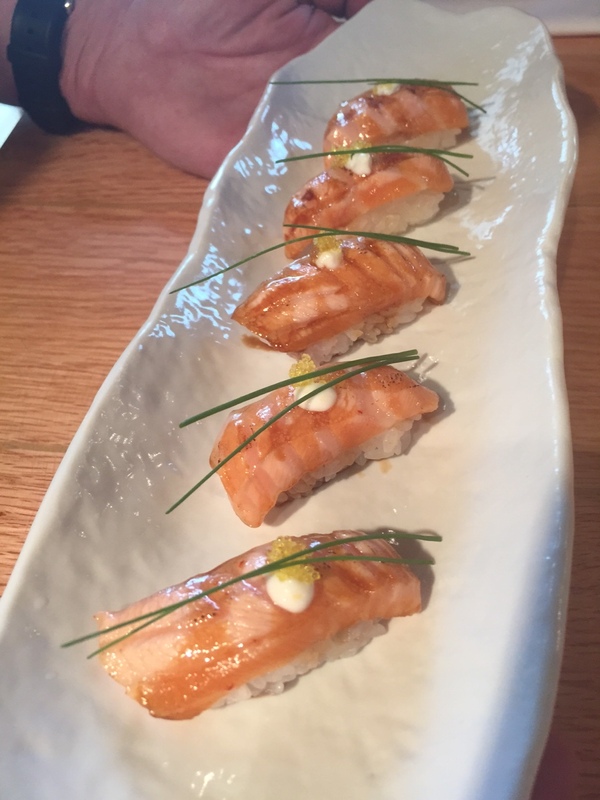 The small plates of creative Japanese cuisine, many made on the robata grill, as well as the sushi, are outstanding, both in presentation and taste. There are also some awesome drinks offered as well with 2 bars to choose from. 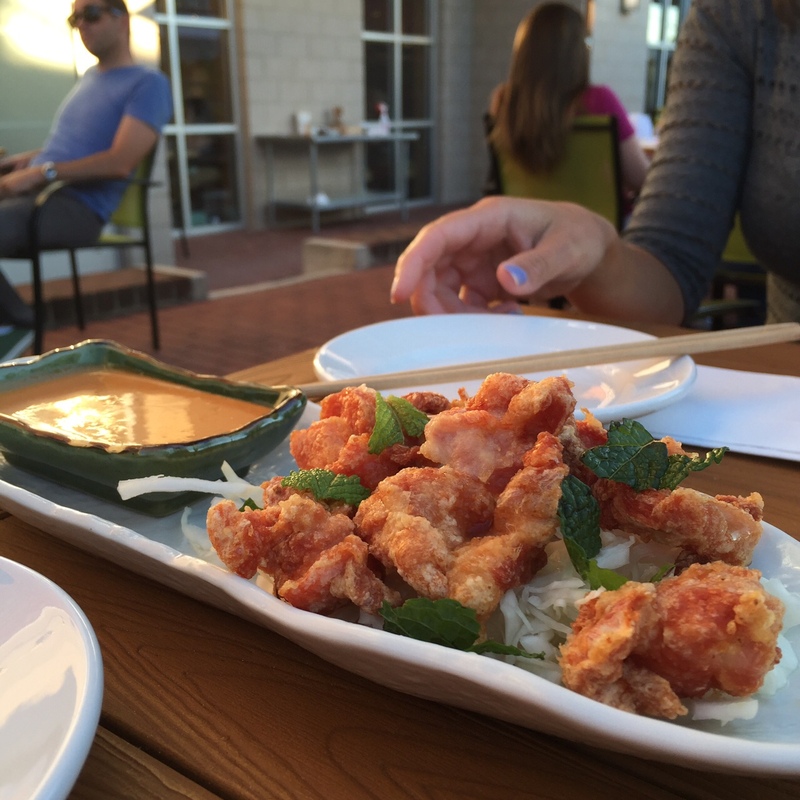 My favorite menu items include the tempura grouper bites, the sushi platter on ice, the black cod, the coal roasted shishito peppers, the pork belly skewers and the sweet potatoes. For dessert the presentation of the truffles with cherry sauce and ice cream on ice can't be beat. Special maki roll with lobster. Tea Brined Robata Duck Breast. Dessert with truffles, cherry sauce and ice cream on ice! Baku is a worthwhile destination for a special occasion or just to treat yourself or your loved ones! Also a great destination for a business dinner or drinks. They have creative cocktails and martinis and an extensive wine list. For a while Sunday brunch was offered and I kept meaning to go but I did not have a chance to sample it. 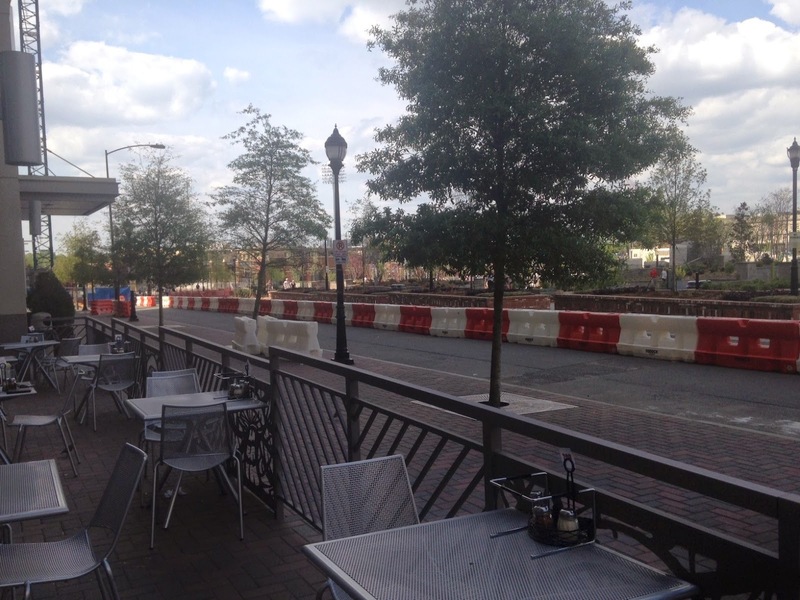 For now, brunch is not being served, but I do hope they might bring it back during the warmer months! I look forward to returning to Baku again very soon. Disclosure: Some of the items described in this review were complimentary.